While our primary extermination target is bed bugs, heat can be 100% efficacious when heat treating to exterminate most organisms. GreenTech Heat provides an engineered insect eradication solution backed by scientific research and 25 years of field testing, research and development. While not designed nor specifically marketed for killing microorganisms, the GreenTech Heat treatment may kill most organisms living in the space we inhabit. Adult male German cockroaches die in 7 minutes at 130°F (Forbes and Ebeling, 1987). Stachybotrys chartarum, also known as toxic mold, is killed in 30 minutes of 140°F (Domsch, 1993, pg. 745). E. coli rarely survive beyond 10 minutes of 150°F (Padhye and Doyle, 1992). Hantavirus is rendered inactive with exposures of 30 minutes of 140°F (Manual of Hemorrhagic Fever and Hantavirus Pulmonary Syndrome. WHO. p. 196). House dust mites are killed after 60 minutes of 140°F (House Dust Mites, University of Nebraska, Bug Facts 013-97). The lethal times quoted by these published reports are for laboratory conditions. Achieving a kill in the real world is dependent upon many factors and our training helps you address the contingencies you will find so you can achieve a 100% kill 100% of the time. Pesticide-based indoor control methods raise concern over the safety of occupants. Our affordable heat treatment systems offer you the ability to perform pest control work without relying on toxic chemical residues. Heat can be used to kill every type of ant and their eggs. Additionally heat can kill bacteria and viruses. Achieve a proven thermal kill for insects with GreenTech Heat Solution's state-of-the-art technology. Our state-tested technology creates heat convection currents which transfer air throughout the room, forcing heated air molecules to transfer their energy into every surface of the room. Developed and perfected by Michael R. Linford PhD, our equipment is designed to be a complete insect heat treatment system without sacrificing quality or capability. Heat is the only truly organic pest control treatment method. Other companies would have you believe that their pesticides are organic or come from natural sources, but every applied pesticide carries with it some level of toxicity. Heat treatments are completely non-toxic and leave no chemical residue, eliminating your exposure over potential client health concerns. Each ePro 400 heater can treat up to 400 sqft in 8 hours. Electric heat treatment packages with the ePro electric heater require 50 amps to operate at full power and run on 120v power. There’s no need for a generator system with GreenTech ePro heaters. Each ePro combines a 3500 cfm fan and 6 heating elements 8 amps each in one powerful unit. You will use 6 power cords per each ePro. The electric system is a “closed” system which means it recycles the heated air inside the structure. A technician does not always need to be present with electric units. You can set up your treatment area, close the door and check on the treatment at a later time. Each Titan heater can treat up to 3000sqft. Propane heat treatment packages will need to have access to outdoors to stage propane heating unit. The heat from the propane heating unit is "ducted" into the room from outside the building. Propane units are faster to achieve the thermal temperature than electric units and will take less time to perform a treatment. A technician must always be present to monitor the heater and the treatment. The Titan propane is highly efficient and penetrates the structure very well, cutting down treatment times. Propane systems will require a propane tank and hoses. A typical 25 gal/100 lb tank will supply enough propane for the entire treatment. Kills insects in places pesticides cannot easily penetrate. We've taken all of the guesswork out of eliminating pests by creating packages specially designed to meet the needs common in your industry. Unlike other heat treatment product manufacturers, we provide full heat treatment training and technical support from our experienced team of pest control professionals and trained staff. Learn to get a kill in one treatment while doing so safely and without damaging the structure or its' contents. Our knowledgeable staff developed this technology is prepared to handle even the most in-depth questions. Our experienced staff will offer you the best and most honest recommendations for your pest control needs. 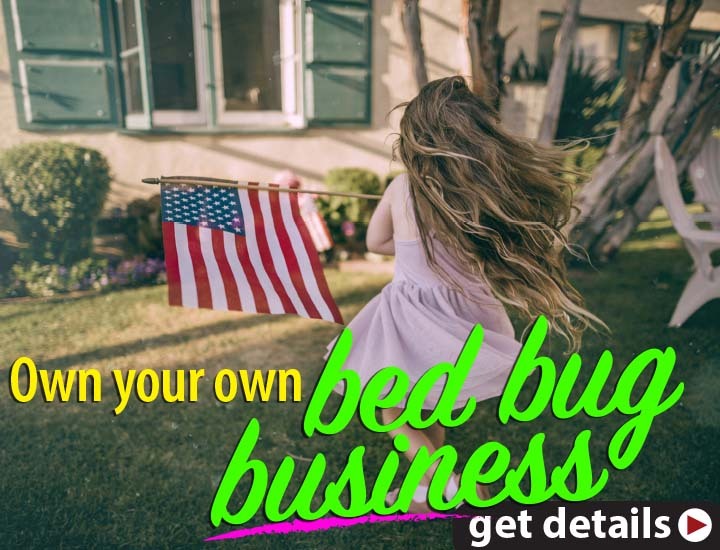 Heat treating hotels or motels for bed bugs has an additional advantage: The guest can keep 100% of their belongings. Even laptops can go through the heat treatment. The hotel does not loose any FF&E. Rooms are out of order for one day maximum. Our equipment will zapp bug and black widow with thermal remediation.